A terrible car crash in Mississauga occurred in the evening of Sunday June 25th and resulted in the tragic death of two children, aged 5 and 13, and the 40-year-old driver of the vehicle that allegedly caused the accident. The crash occurred when the driver of a Mazda 6 lost control of his vehicle and crossed into the oncoming lanes of Winston Churchill Boulevard, crashing into a Mercedes travelling in the opposite direction. The two fatally-injured children were passengers in the Mercedes, and three other occupants of the Mercedes were also injured, including the male driver, a woman and a girl. The Mercedes driver sustained only minor injuries; however, the female passenger, 25 years of age, was reported in critical condition in a Toronto hospital and the girl, 7-years-old, suffered a broken leg. At the time the accident was reported, police had not yet determined whether the occupants of the Mercedes are related. Police were speculating that speed was likely a factor in the car accident, and a follow-up investigation is expected to determine the circumstances leading up to the crash. As reported by CBC News, the fact that accident victims were found on the ground after the crash suggests the possibility that some of the vehicle occupants may not have been wearing seatbelts. Although Canada has among the lowest incidence of car accidents in the world, car accidents still occur far too often and in Ontario, summer is typically the season that sees the greatest number of motor vehicle accidents, particularly fatal car accidents. This is likely not surprising because it’s during the summer that many Canadians take road trips, visit the cottage, go camping and travel to vacation destinations and visit friends. For the most part, car accidents occur due to a mistake in judgement or a negligent action, and distracted driving, speeding and driving while under the influence continue to be the most common causes of motor vehicle accidents in Ontario. It takes only a few seconds of inattention to the road to cause a driver to lose control or to fail to react to an unexpected traffic situation, and driver inattention, whether due to the use of an electronic device or another distraction, has been the leading cause of fatal car accidents in Ontario for several years. Unfortunately, a failure to take care, even for a brief time, can result in life-shattering consequences for ourselves, passengers and other road users. If you or a family member were injured in a motor vehicle accident and you wish to make a claim for damages, whether due to a car accident, motorcycle accident, pedestrian accident or cycling accident, call a knowledgeable Mississauga car accident injury lawyer today for an honest evaluation of your case. Certainly, no amount of money can compensate for a catastrophic injury, but financial compensation can at least alleviate the financial burden due to loss of income, rehabilitation costs and other expenses, and also aid in the recovery of seriously injured persons. Car accident victims typically have two options for obtaining injury compensation: 1) statutory accident benefits on the motor vehicle insurance policy; and 2) commencing a civil claim against the driver responsible for the accident. 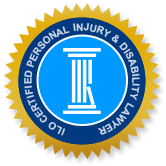 Seriously injured persons who have long-term disability (LTD) coverage through their employer or another plan may also be eligible for LTD benefits if they are unable to perform the essential tasks of their job, due to their injury. You can find out more about your options for receiving injury or wrongful death compensation by speaking with respected personal injury lawyer.